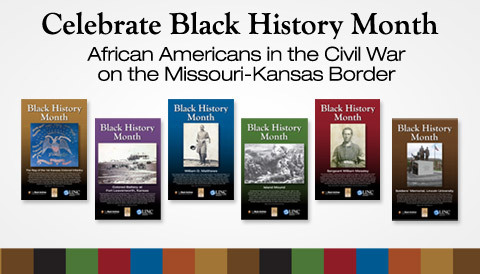 LINC is again pleased to produce and share its annual Black History educational poster set and booklets along with its partners the Kansas City Public Library and the Black Archives of Mid-America. This year, in recognition of the Civil War sesquicentennial, we highlight the involvement of African Americans in the conflict, which had its origins in the earlier “border wars” between Missouri and Kansas. The Civil War was a brutal, bloody conflict over the issue of slavery, its expansion and other issues. It enveloped the nation like no other event before or since. During the Civil War, there were 29 battles fought in Missouri and 4 in Kansas as part of the Trans-Mississippi Theater. This does not include the ongoing guerilla skirmishes involving irregulars. In total, there were 10,500 armed conflicts in the nation during the war. Approximately 200,000 African Americans served in the Union Army or Navy; 40,000 of these died – 30,000 of infection or disease. The Civil War was a monumental event in the history of our country, and in the lives of the African Americans we remember here. Copies of the booklets should be available at Kansas City Public Library, the Black Archives of Mid-America and some branches of Mid-Continent Public Library. The Black Archives of Mid-America is also creating teacher's guide and other educational which will be available through their website or contacting them by phone at (816) 221-1600. LINC also is willing to send, at no cost, copies of this year's materials to the public. Place your order online or call (816) 410-8388.